Beautiful design. Simple process. Friendly help. 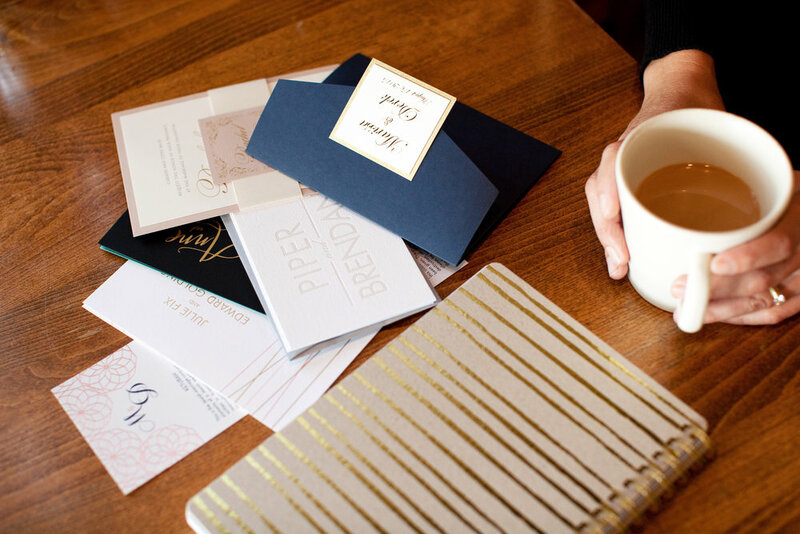 Have you been searching for invitations that fit your style? Do you want invitations that are more “you” than a “cookie cutter” design? Are you baffled when it comes to wording and what to include? You want your invitations to be “you” and to perfectly set the tone. It can be frustrating and time consuming to shop for invitations, save the dates, programs, place cards, etc. Have you spent hours browsing online, feeling no closer to a decision? Or, are you overwhelmed with where to even start? Our process is easy and starts with a no obligation meeting. We meet you at a coffee shop or by phone. We send a quote and custom designs for you to review. We perfect the design and design inserts. You mail the invitations and get ready for rave reviews. We check in 1 month before your wedding to get started. We create the pieces you need. You get married - relaxed because everything is taken care of! You’re newlyweds! We love helping couples and families live their best life. Check out Who We Are Family, where we provide simple steps to create a family mission statement + a sign to help you kick off your married life clear about who you are and what matters most. Sarah was incredible to work with! Wedding planning was so stressful, and after meeting Sarah I knew my invitations were going to be the best! Sarah calmed my nerves, gave me tons of options, and was very prompt and flexible with pick up times when my order arrived. Sarah is AMAZING. She listens to what you like and works to give you exactly what you love in your design! We provided Sarah with the details of some elements we knew we wanted, but where we weren't sure, she was able to guide us with elegant artistry and suggestions. She was prompt with responses to edits, and had great ideas and brought a lot of insight in to making choices based on her previous experience. Sarah was so great to work with! She did such amazing work and we could not have been happier. Our first meeting was so much fun. We were able to pick a design a get started. She also came up with some creative ideas to bring in other things we talked about. We could not have been happier with the save the dates, invitations, and all of our day of items. I would recommend her to anyone!